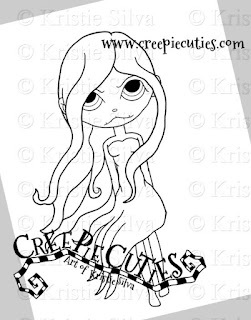 Creepie Cuties - The Cute Side of Creepie: ??? I have a new wip (work in progress) shot for you guys today. I'm not exactly sure where this painting is going yet, could be a girl just walking, a zombie or a fairy who knows. Either way I love how I am finally getting movement into my paintings. I use to make it where the girls are so stiff but I am trying my hardest to do more action pack paintings. I still have a lot to learn but getting there =D I always think though no matter how could you get you can always learn new stuff. So there is always improvements to be made.